PULLMAN, Wash. – Washington State University Provost Dan Bernardo didn’t break a sweat as a few thousand honey bees formed a beard on his face for a good cause Friday afternoon. Also standing for a bee beard was Paul Stamets, founder and president of Fungi Perfecti. 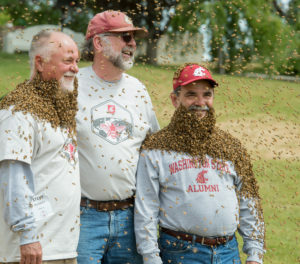 Stamets has worked with WSU bee researchers on ways to use mycelia to help bees. He donated $50,000 to the bee center to help kick off the campaign. The cost of the facility will be $16 million, and the goal is to raise all of that money from private donations, meeting full construction cost-analysis obligations. In addition to research labs, the new building will include a screened observation area allowing the public to watch bees in demonstration gardens. It will include classrooms and instructional facilities, something the program currently lacks. The facility will host visiting scientists from around the world who come to Pullman to learn the latest techniques for cryogenic storage or to conduct research.